If you like hard news, you should have been in heaven in Toronto on Friday night. Unfortunately the local media didn't do a hell of a job covering it. The major union for Toronto Transit Commission workers called a surprise strike last night, giving the city just 90 minutes notice that they were shutting down the nation's largest transit system. The strike (arising from the rejection of a tentative settlement) stranded thousands of people who were out blithely enjoying a warm spring Friday night in the city's core. Breaking, ongoing, late night news like this is about as tough a stresser of a newspaper's abilities as you can find and it's instructive to see how it was handled here, in media-rich Toronto. The TTC union executive narrowly accepted (8-7) a tentative contract earlier this week and it was put to a vote of members all day Friday. At about 10:30 pm last night the union issued a press release saying the offer had been rejected by 65% of workers and as a result they would walk out at midnight. The Mayor held a press conference moments before midnight decrying the move and vowing back to work legislation from the province. The system shut down at midnight just as thousands of people began streaming out of movie houses and bars and restaurants. Think of that - thousands of Torontonians pouring out of bars and clubs and restaurants looking forward to nothing so much as their distant bed, and finding suddenly they had no way home. What would happen? Riots? Innocents struck down on darkened streets as they trekked home alone and on foot? Toronto Sun: Back when I worked at the Sun they would have "flooded the zone" on this story — held the print run and dragged reporters and editors and photographers out of their beds and bars and fanned out across the city to put together a comprehensive, photo-packed pullout complete with howls of outrage from one or more columnists. As I write this (5:30 am) I haven't had a chance to see what they've done in print, but their web offering is pretty pathetic - a single story that looks be re-purposed print content. No offence to reporter Brian Gray who, by himself, turned in a perfectly respectable hard news story - it's just that it's pretty thin gruel on a story that the old Sun would have feasted on. To make matters worse their website left up a story dated Saturday (their original Sat print story?) that began: "TTC workers were expected to ratify a tentative deal yesterday during an all-day voting process, despite a group of workers grumbling about the agreement." Ouch. on their home page and a pair of decent late night/early morning stories (The news, and the reaction) that appear to have drawn on the reporting of a half dozen staffers. When I looked this morning, the web fed me stories staff had filed at 4:30 a.m., although I presume their web staff had been filing all along. And they've gathered the stories onto a topic page (their Transportation page) and made sure to link to the previously prepared Strike Survival Guide - all good stuff. But the video is a CP video, not staff. (Good job by CP, by the way - proof that their video camera in every reporters' hands and centralized editing is paying dividends). 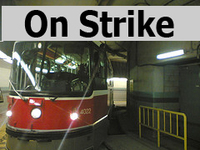 And while they had a "blog" page devoted to the TTC strike - I'm sure part of their earlier preparation when a strike seemed very possible - it wasn't linked to until later in the morning and offered no breaking news coverage of the surprise strike. The blog page picked up later Saturday morning, but at that point it really seemed too little too late. If I had spent 2 hours walking home because of the strike and, once home, checked thestar.com to see what was going on, I would not have gotten the sense that they felt that something big had happened. What about a video or two? What about photos - a gallery? Globe and Mail: Kudos to the print team at the Globe - which used to be known for early deadlines and a disdain for anything as plebian as breaking news. When I picked up my paper at 5 am they not only had the TTC strike on page one, they had the Mayor's comments and promise to push for back to work legislation, which mean they held their local press run until well after midnight. On the web they did less well. I suppose they deserve some points for trying. They did produce a post-strike TTC riders' reactions video but the quality was abysmal (sign that videographer up for Backlighting 101), and that's saying a lot coming from a "good enough is good enough" evangelist like me. The paper launched a blog which ran for about an hour, between midnight and 1 am and seemed to be either scraps from reporters notebooks or bits of the story they were about to file. The Globe also did the right thing by soliciting photos, videos and stories from readers in a pretty prominent front page link - but at 5:15 am there was nothing apart for a long list of union-bashing comments from readers, most of whom didn't seem to live in Toronto or the GTA. I guess the Globe's Toronto readers were already in bed when it happened. Not so at the surprising National Post. National Post: In print they managed to deliver a paper to my doorstep by 5:30 am that included a front page story of the strike, but it was thin, and clearly written before the mayors statement and before the strike itself had actually started. BUT on the web the Post was the clear winner, thanks to web editor Kenny Yum and his team. The Post launched several blogs last fall, including "Posted" which filters other media into a Post news blog (a smart, if unevenly produced idea), and Posted Toronto - which is where the Post crew threw up a a constant stream of TTC strike updates. Readers contributed photos and written reports to augment the hard work of the Post crew. The result - while uneven and at times perilously unprofessional - was at least urgent and up-to-date. Which is exactly what newspapers should be delivering via the web at times like this. One could argue - and doubtless editors at the Sun, Star, and Globe did - that there were very, very few readers online at that point in the evening, and therefore web coverage was not critical. To which I would reply that we no longer have that luxury. When something as big as a surprise transit strike leaps up and bites the city in the bum, it becomes a talking point FOR THE WHOLE CITY. Some of them will visit your web site, hoping for information. If they see you doing a crappy job, or a half-assed job, they're going to assume you just don't get it. And they're not coming back. Torontoist: A pure blog, local news play that's part of a continent wide blog chain, Torontist had the strike story up within minutes of the formal strike announcement (I can't tell when the newspaper sites first posted the news) but surprisingly their coverage was pretty limited - with most of the action taking place in the comments section. They locked the post as their top item, and have continued to update it throughout the day. Unfortunately they haven't updated their photo, which makes the blog itself look old and stale - a big mistake. BlogTo: Another city news blog,and this one did some impressive work, in some ways. For one thing their post - which they too have continued to update - included photos from their readers that recorded vandalism from angry stranded passengers and a YouTube video of the Toronto Mayor's midnight press conference, apparently posted by a union activist. Bottom line - While the newspapers demonstrated that, by and large, they know what to do in print when news breaks at deadline time, their performance in the immediate and interactive online world was spotty at best. While all three major dailies recognized the value of a "river of news" to cover breaking news, none really delivered on the promise of that medium, although the Post came closest. Many sent staff out into the streets, but few really capitalized on all that writing talent spending all that time out there - reading the blogs and stories I never got anything close to a narrative or immersive experience and surely there were some great stories to be told out there - grab the stuff as it's happening, throw it up quick, harvest that for print AND then pull it altogether with a piece that leverages that huge investment you made in coverage. Whooops - thanks for pointing that out. It's fixed now.